A moderately slender, elongate fish. Males and females are similar in size and appearance. Dorsal surface green-grey, lower sides and ventral surface silvery. Black spots on the sides form a series of narrow longitudinal rows above and below a dark, mid-lateral stripe. 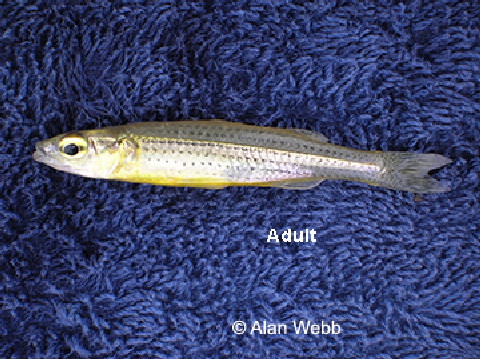 Breeding males are silvery-grey or yellowish and have a yellow belly, and the back is darker. These shoal forming fish are generally in shallow water, both slow and fast moving. Feeds mainly on small invertebrates (aquatic and terrestrial insects and crustaceans) and some algae and aquatic weeds.